Looking for the best fridge freezer to complement your lovely kitchen? After choosing the perfect finish for your worktop, tiles for the splashback, or paint colour for the feature wall, buying a fridge freezer might not feel like the most exciting part of putting together a kitchen – but there’s more to them than you think. Between oversized American-style fridge freezers with double doors and oodles of storage, and slimline models to suit more modest budgets, there’s a whole range of fridge freezers out there to suit all needs. We've picked out the best fridge freezers around, to suit all kitchen styles, sizes – and all budgets. Then, why not have a read of our appliances guides for more great kitchen appliance buys? First of all, think of the space you have available in your kitchen. A side-by-side fridge freezer looks magnificent in the brochure, but it'll surely overwhelm small kitchens, so look for a slender fridge-on-top model instead. If you don’t freeze much, a tall fridge with a single freezer compartment may do. A fridge with a bottle rack is a must for white wine and sparkling wine drinkers, while one with extra door storage will suit cooks who like to have a large range of sauces and condiments to hand. As well as the footprint of the fridge, think about the interior capacity. Some, like Doctor Who’s TARDIS, are bigger than they appear on the outside – we’ve listed each fridge freezer’s capacity in litres for easy reference – but be mindful of these numbers, as being stuck with a fridge freezer that’s smaller than you need is no fun. Lastly, we’ve included the noise output of each model in decibels (dBs). If you’re looking for a fridge to go into a garage or annexe, you won’t have to pay these numbers much mind, but if you live in a bungalow, or have a living room or bedroom near to the kitchen, make sure you go for something that won’t disturb your downtime with loud buzzing (around 40dBs and lower is considered 'quiet'). Fridge-freezers used to only come in white, but these days you can make a bold statement while keeping your food cool. Freestanding models now come in a variety of finishes and colours – from Cherry Red to Fresh Lime, matt stainless steel to on-trend aluminium. Look for ones designed to withstand tiny handprints if you've little ones with sticky fingers. From frost-free to independent controls for different sections, voice activation, water and ice dispensers, holiday modes, fast-freeze and low-noise output, think about your wish list before you shop. Look out for the energy rating, too, which should ideally be A+ or above. Many hi-tech features now appear on mid-price units. If you have the space, a side-by-side American style fridge freezer can make a wonderful addition to your kitchen. This LG model’s large capacity suits big families who like to keep a range of fresh and frozen food to hand, and it’s also great for those who like their drinks. It has an inbuilt non-plumbed ice and filtered water dispenser and great storage capacity. It's highly energy efficient and has an exceptionally quiet motor. An all-round winner. Shop more John Lewis & Partners fridge freezers. This side-by-side American-style fridge freezer features a 384 litre capacity fridge and a 207 litre capacity freezer, as well as an A+ energy rating. The fridge space is full-width, ideal for fitting a turkey, large platters or a triple-tiered cake. It also features three shelves, two drawers and six door shelves. With an adaptable FlexiFreeze department, the freezer has four drawers and two pull-out shelves to store your food. It also has three different temperature settings to choose from: Soft Freeze (-7°C), Mild Freeze (-12°C) and Deep Freeze (-18°C). Thanks to its 6TH SENSE® FreshLock system, your food, fresh and frozen, will stay edible for longer, and the fridge freezer also boasts a Holiday Mode, so the freezer can stay operating while the fridge rises to 12°C to eliminate bacterial growth. Shop more Appliances Direct fridge freezers. This new AXI fridge-freezer is Hoover's new connected model, that can be controlled by the Hoover Wizard app – there's even an Ice Drink Coach to notify you when your chosen beverage is chilled to perfection. Rated A+, its cut-away door sides score high on the style stakes. The best fridge freezer for tech lovers, we think. Yes, this fridge freezer actually has a built in camera. Why, you ask? We’re not entirely sure but we think it’s kind of cool. You can sync your camera with the Wi-Fi and remotely monitor the appliance from your phone. This is actually a really handy tool if you’re out doing a food shop and can't remember what you do and don’t have. It’s easily the best freezer for gadget lovers and even though some might think it’s totally unnecessary, it is a well-functioning freezer. We’d say the capacity is still a little on the small side for larger families, but for anyone looking for a freezer with the latest tech, it's the perfect choice. Find more smart home tech for your kitchen in our expert buyer's guide, or shop more fridge freezers at AO. If you love having friends around, the GQN21220WX fridge freezer in stainless steel from Grundig even has its own wine cooler compartment to store (and show off) your collection. Duo Cooling separately controls the fridge and frost-free freezer compartments while the FullFresh+ Crisper keeps food fresher for longer. There's plenty of capacity, too, with 466 litres for the fridge and 73 litres for the freezer, along with a plumbed in water and ice dispenser. The best fridge freezer for those who love their wine, and to entertain, we think! Browse more fridge freezers at Currys PC World. Retro on the outside yet advanced on the inside, this sweet Smeg fridge is a must-have for vintage kitchens. It's available in several colours so you can match it to your colour scheme, and its curved lines really stand out, a far cry from the usual white or silver offerings that’ll give your space an instant dose of ‘50s diner cool. It also boasts the best efficiency rating, a fast freeze function and a frost free feature, so it’s certainly not a case of style over substance. Discover some retro kitchen design ideas if you want to take this look all the way, or shop more John Lewis & Partners fridge freezers. This Siemens fridge freezer makes a very attractive and hard-working addition to any kitchen, especially for the small price tag. Our pick of the best fridge freezer for anyone on a budget, it offers efficiency and a slick look, as well as an impressive all-round performance. With a humidity-controlled produce drawer and space-saving built-in bottle rack, it has all the room you need. The glass shelves are also removable for easy cleaning, and the durable stainless steel outer is resistant to fingerprints, so it’s easy to keep it looking smart. You might think that another smart device is the last thing you need in an already busy family, but the clever capabilities of the Family Hub can be really helpful when it comes to getting organised. Its touch screen is Wi-Fi enabled allowing you to coordinate calendars or even re-order food. The interior camera takes a photo of your shelves that you can reference while out shopping, and the CoolSelect function allows you to convert a section into extra fridge or freezer space, great for increased capacity over Christmas. Shop more fridge freezers at Very. This sleek black fridge freezer will look stylish in any modern kitchen, while offering a range of space-saving solutions for maximum flexibility. Two doors means twice the number of in-door compartments, perfect for the household with lots of jars and bottles. Great for wine lovers too, its built-in elevated wine rack allows bottles to be chilled to perfection. The antibacterial liners are also a nice touch, too. 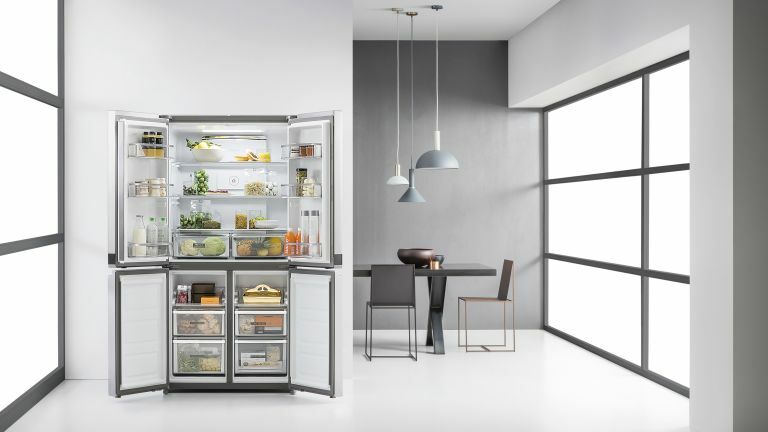 In all, an excellent, stylish, mid-range fridge and the best fridge freezer for those who like to be organised. TIME FOR AN APPLIANCE REFRESH?